BNM has finally came out with a comprehensive guide on how Islamic Banks in Malaysia can charge late payments on default accounts. This is certainly good news for the Banks, as for the longest time, Islamic Banks have been abused by delinquent customers due to the low penalties for late payments. Historically, BNM has only approved a 1.0% p.a. compensation charge on arrears with the intention to cover actual costs of managing the non-performing account. Comparatively, non-Islamic Banks have been charging the loan interest rates + the penalty rate of 1.0% for delinquent accounts. If the interest rate for the loan is 4.40%, non-Islamic Bank will therefore charge 5.40% p.a. on the arrears. Until recently, non-Islamic Banks is also charging this based on a compounded basis. While on the onset we see that the new guidelines will aim to address this imbalance, a close assessment of the guidelines will show the Banks that the imbalance is still not fully addressed. What it alleviates is only the point of removing the abuse by the customers. If a non-Islamic Bank can charge a penalty fee of 5.40% p.a. on the arrears, Islamic Banks can also do so (technically). Banks are allowed to charge Late Payment Charges (LPC) up to the Average Financing Rate (AFR) of a portfolio. For example, the portfolio of an Islamic Mortgage has an AFR of 6.0% p.a., the Banks can therefore charge an LPC of up to 6.0%. This calculation of 6.0% must be submitted to BNM on a yearly basis for their review and approval. The LPC itself is split into 2 components i.e. Compensation (Ta’widh) and Penalty (Gharamah). 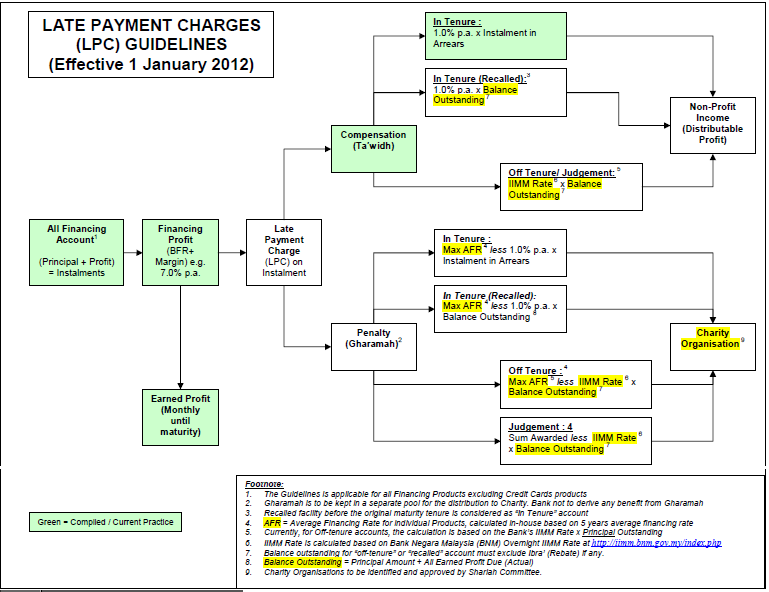 Banks are allowed to charged either LPC i.e. Ta’widh + Gharamah, or just Compensation i.e. (Ta’widh). If the Bank chose only to charge Ta’widh (which is business as usual for most Banks anyway), the maximum rate chargeable is up to 1.0% of the arrears amount (non-compounding). This 1.0% charge may be recorded in the Bank’s books as “Revenue” to off-set the actual expenses incurred in managing the delinquent account. This 1.0% charge must also be review, justified and approved by the Bank’s internal Sharia committee members on a yearly basis. If the Bank chose to charge the LPC i.e. both Ta’widh and Gharamah, there is a specific treatment required for Gharamah. While Ta’widh’s treatment remains the same as above, Gharamah can only be taken for the penalising the delinquent customer but without benefiting the Bank. This means the Gharamah portion must be flowed into payments to Charity and must not go into the revenue books of any kind. The Bank must not derive any benefits from Gharamah, directly or indirectly, and this Charity amount must be managed under the oversight of the Sharia committee. As mentioned, the maximum that can be charged under LPC is up to the AFR rate. If the AFR is 6.0%, this means the Bank can recognise up to 1.0% of Ta’widh as its revenue, while the remaining 5.0% is to be taken as amounts for charity account. There is also a change in the compensation for off-tenure accounts i.e. accounts already expired or matured. For such accounts, BNM allows the usage of the daily Islamic Interbank Money Market (IIMM) rate for the LPC calculation on the Balance Outstanding. In this case, the whole amount can be recognised as Bank’s revenue. While this is a good measure to allow the Banks to charge compensation accordingly to minimise risk of default, it does not provide a level playing field for Islamic Banks as the compensation for non-Islamic Banks can be fully recognised as “revenue”. Because of this, Islamic Banks are reluctant to make the changes to their systems, processes and documentation (which will incur development costs and valuable man-hours) to accomodate Gharamah where no revenue can be recognised. To spend money to develop a feature that gives back no returns to the shareholders would not make any economic sense. As such, the leniency afforded by the LPC Guidelines is just on paper. Nonetheless, the intention of the guidelines is to deter and control delinquency. That may yet be motivation enough for some Banks to make this development. Click here for the full Guidelines on Late Payment Charges. May I know if SAC latest released resolution will automatically supersede old version of resolution? Eg 2012 Resolution on Tawidh will supersede 1998 resolution on Tawidh? Also, Islamic Banks in Malaysia must follow.the latest version of resolution when deriving Tawidh calculation? In general we will refer to the latest documents for compliance. If there is inconsistencies, the latest document prevails for new cases. As for existing cases, the new regulations may or may not be adopted by the bank. Generally, we allow the existing cases to follow the older regulations unless the newer regulations are more fair to the customers. Mr Amir Alfatakh, thank you very much for your reply and explanation. I still have doubts as below, I hope you can assist me. 1) BBA Islamic financing contract was signed in 2005, 8 years tenure and tawidh rate was 1 % in contract , client default in 2008, facility recalled by Bank in 2008, client made full settlement in mid 2012. (a) may I know shall bank follow tawidh rate and computation as per Late Payment Charges guideline 1/1/2012 because client made full settlement in mid 2012? Or bank can follow 1998 SAC guidelines for tawidh rate? (b) what was.the relationship between client & bank after facility recalled in 2008? Will the financier v client relation maintain until mid 2012? (c) will the tarikh matang maintain until.end of 8 years ie 2013 Or right after 2008 after the facility recalled? (d) in this situation, shall new version law supersedes older version? Mr Amit Alfatakh, can I have your email? I am not sure if my reply and further questions went through because seen an error message just now. Thank you. The intention of allowing the late payment charges by BNM must serve a couple of things ie #1 is to stop the customer from abusing the arrangement and #2 ensure that the bank do not suffer unnecessary losses (but not to earn additional profit). Therefore you need to consider a balanced approach of deciding on a rate suitable to the customer so they will not abuse the system (if too low) and not be a big burden for them to make payment (if too high). I am not sure what you mean by “profit rate below AFR”, but the idea of AFR is that it is the “right” rate for your institution. The concept of AFR (Average Financing Rate) is not the same with BFR (Base Financing Rate). AFR looks at your own cost of funds + average margin that you charge, and therefore determined by your internal funding structure, whereas BFR is a market rate that is determined by BNM for the industry to use as a base rate. So, your AFR is really your own profit rate, which will consist of your cost of funds and your spread. It is then ok to charge AFR for your purpose. But I think there could be a mix up in your assumption. 1) 1.0% ta’widh rate x Overdue Arrears ie Instalment. This 1.0% is to compensate for the bank’s actual costs of recovery efforts. 2) IIMM rate x Outstanding Balance for expired financing i.e. outside the tenure agreed from the Aqad. So if the Aqad is for 60 months, and after 60 months there is still Outstanding Balance, the Bank is not allowed to earn “additional profit outside the Aqad”. The bank can only collect a sum to offset borrowing costs (cost of funds), and the closest indication of cost of funds is the IIMM rate published by BNM (overnight borrowing rate). This is to compensate the cost of funds only, but not to earn additional margin or profit from the Outstanding Balance. So, in events of default, the late payment chargeable is to compensated actual recovery costs (1.0%) and/or borrowing costs (IIMM Rate).This is to compensate the bank. But how do we discourage delay in payments and abuse of the loan agreement? BNM allows you to charge ANY rate to discourage the customer from abusing the deals. It could be 10% x amount in arrears or it could be 5% x amount in arrears. For Banks, to give a guide on what rate to decide, and be fair to consumers, the requirement states the maximum rate a bank charge to discourage abuse must be based on Average Financing Rate (AFR). Banks are asked to show BNM on the method of coming up with the AFR, and obtain BNM approval on the methodology and not be oppressive to consumers. Each Bank must submit their own calculation, and can differ from Bank to Bank. 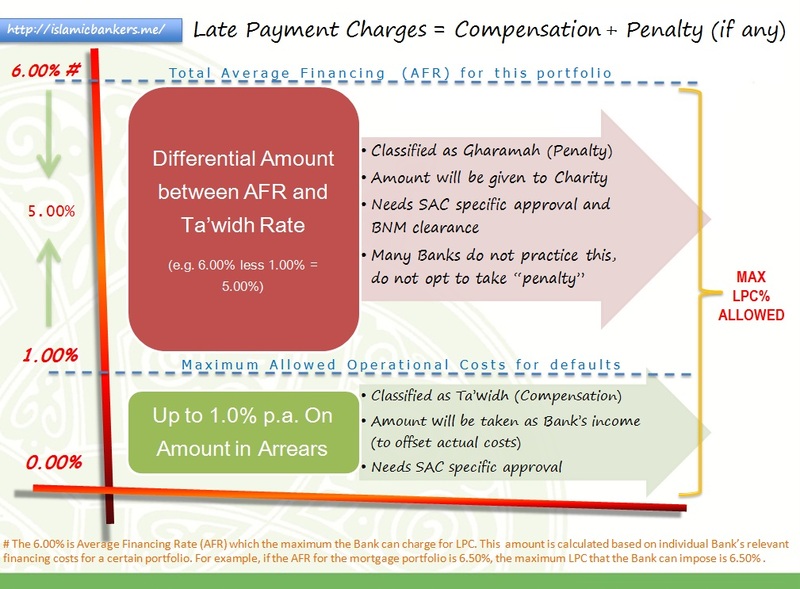 2) Gharamah (penalty) which is the difference between the AFR and the Ta’widh rate of 1.0% or IIMM Rate. This amount cannot be recognised as your income as it is an amount outside the agreed Aqad, so it must be given to charity. So if the AFR is 6.0% p.a. and the IIMM Rate is 3.12%, the 2.18% (i.e. 6.0% less 3.12% = 2.18%) must be given to charity as you cannot recognise it as an additional profit or spread. Therefore in your case, the calculation should be consistent. 2) If the account is 30 days due or default: Your financing pricing profit will remain as 4.5% pa x Principal Outstanding. Your instalment of RM1,000 will now have a late payment charge of 0.83 sen (RM1,000 x 1% p.a. /12 months = RM0.83) which you keep as compensation; or if you want to use your financing rate of 4.50% as AFR, then you will charge the customer a rate of 4.50% x instalment i.e. RM3.75 (RM1,000 x 4.50% p.a. / 12 months = RM3.75). However, you can only keep RM0.83 as your compensation and the balance of RM2.92 (RM3.75 less RM0.83 = RM2.92) you will give to charity. Therefore if you want stop the abuse, decide on an AFR to charge and charge it to your customers instalment, and any amount above the allowed 1.0% p.a. Ta’widh, pass it to charity. So, you stop the abuse with the high rate of default, and if they still default, collect the amount and pass the penalty amount (gharamah) to charity. I am not sure if Govt intends to follow BNM guidelines to Bank, but I think it is a fair regulation to follow or be guided with. You can be consistent with the market and the guidelines. Hope that helps. Apologies for the long-winded writing. If I were to make an advance/early repayment of $10,000 how would this affect the balances above? Should the “Outstanding Cost of Finance” simply be reduced by a corresponding $10,000 (as would be the case in a conventional home loan)? Generally, if you pay RM10,000 the amount would reduce both the Outstanding Balance and Outstanding Cost of Finance (Principal) by the same amount. The profit will be calculated based on the reduced principal for the following month. This is consistent with the conventional counterpart, if the bank is an Islamic subsidiary or windows. But I have to caution you that there are some banks that practice otherwise, ie the RM10,000 DO NOT reduce the principal but stays as “Advance Payment”. Usually, if the conventional bank practice this calculation, the subsidiary will follow the same method. If the conventional parent REDUCE the principal, the islamic subsidiary will also follow suit. This is to ensure consistency.